Case Truck ... can you help? 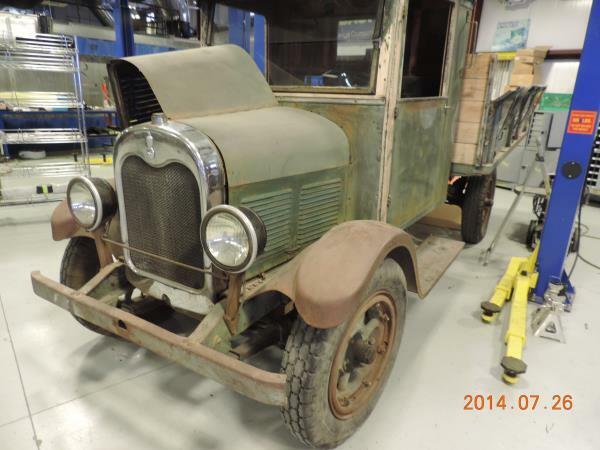 The subject pictured here is a 1923 Case Truck, rated as a 1 Ton. It was manufactured at the spinoff plant in Wisconsin. In quite good shape, the subject is in the process of restoration in Tucson, AZ. A quandry has arisen concerning the vehicle's most appropriate frame color. The default color is Black. However, there seems to be a possibility that the chassis frame was painted Case Green. As this is a museum restoration, we'd like to get it right. I have been to several archives and museums to no avail (J.I. Case Historical Society, Wisconsin Historical Society, etc.). Do you know, or can you direct me to someone who can verify, the chassis paint color for this vehicle? Thank you. In the picture it is obviously body color, take some sandpaper to the frame and find out if there is another color beneath it. If not, you will know the answer. That's an interesting truck. You should post your question in the Peter J section, more people will see it. That is a very interesting truck. At different time periods Case seemed to favor 2 tone paint on their machinery and for another period it was all one. Don't have any idea of the reasoning behind this. Strictly as a guess I would think if the fenders and running boards were different from the green then maybe the frame matched them but definitely a guess. I don't think I have ever seen a Case truck.